Stir-fries are great for using up all the extra vegetables in the fridge, but sometimes they can feel a little scatterbrained. For this one, the orange sauce pulls everything together so you don’t get that “disorganized pile of random vegetables” effect. You can keep it sweet or make it spicy with a bit of homemade Sriracha sauce and some red pepper flakes. 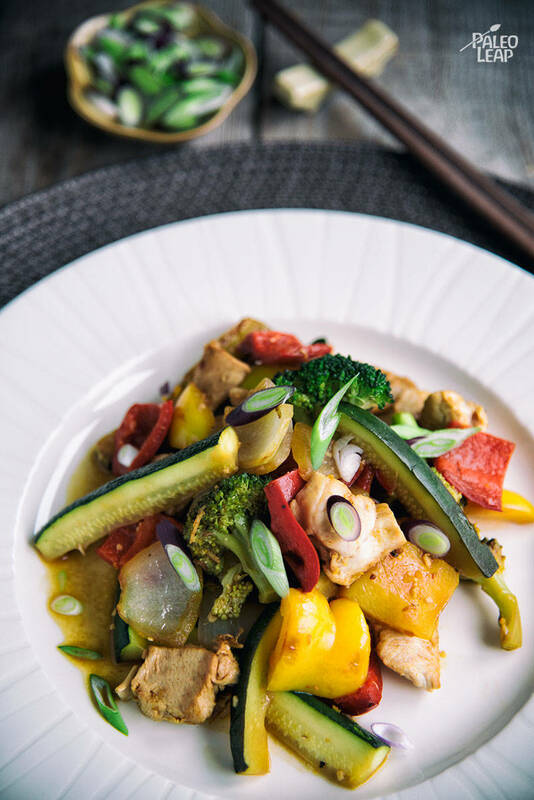 Stir-fries are really easy to modify for whatever diet restrictions you have – you could make this one a lot lower in FODMAPs or compliant with the Paleo autoimmune protocol just by switching out the right vegetables. If white rice isn’t in the cards for you, try serving this over some cauliflower “rice,” or your favorite variety of Paleo noodles. In a bowl, stir together the chicken stock, orange zest, orange juice, coconut aminos, ginger, garlic, Sriracha, and red pepper flakes. Add the chicken pieces to the skillet. Cook for 6-8 minutes, until cooked through and browned on the outside, and set aside. Place all the vegetables in the skillet and cook until they start to soften. Pour the sauce into the skillet, making sure to scrape the bottom of the pan, and bring to a soft boil. Lower the heat and return the chicken to the pan. Stir everything to combine and serve hot.